On a lazy sunny afternoon sipping a drink with our friend Sal, we tried to convince him to take us for a short visit to see his wonderful lemon gardens, being the lemon tour of the Amalfi Coast an amazing experience also for us, the locals. Sal gracefully accepted but he was also a bit concerned because when old friends have not seen them for many years something strange could happen. An appointment was made for the next day at 10am but Sonya and I wanted to be treated like simple clients who take the tour daily, so we asked if he would come to collect us with his funny electric lemon car at the bottom of the steps of the St. Andrea Cathedral in central Amalfi. He drove very carefully and had to make several beeps (as the electric car is silent) to warn the few tourists that were wandering around for some early shopping. Sal and his brother are the fourth generation of lemon farmers. He resigned from his boring job as a business consultant and moved back to manage the lemon gardens. They produce a wide selection of limoncello and herb liqueurs in their distillery and they have also a retail shop in the main square of Amalfi called ‘La Valle dei Mulini’. But the shop is nothing compared to the stunning Lemon gardens: they are amazing! The beauty and the excellent yields are due to the hard work of Gigino, their father, now known as the “King of lemons”. He is eighty and he still gets up at 5 in the morning and works tirelessly all day long in his garden. He knows each lemon plant, he keeps the secrets of how to make pergolas, how to cultivate without the insects, how to strengthen the weaker plants. He was the wizard of lemons before he became the king! Our wonderful tour ended seated in front of a fresh lemonade and a delicious slice of homemade lemon cake. This time we declined the limoncello tasting because we wanted to remain sober during the day at least. We rested on the hammock and we did not want to leave. When you visit heaven you want to stay……. 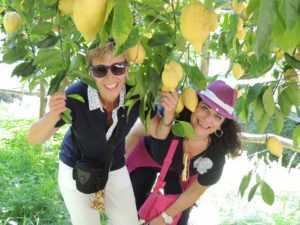 Here at the Hotel Aurora Amalfi we always try to immedesimate with our guests and try in first person the experiences we suggest them, like the famous lemon tour of the Amalfi Coast. If you want us to help you organise this tour, to have fun like we did, away from all the stress and problems of your busy lives, contact us to receive all the information and book your experience. As they say, when life throws you lemon, go make lemonade. Or better, limoncello!